One Abbey Lane is a one bedroom apartment with flexible accommodation available for short or medium term stays. 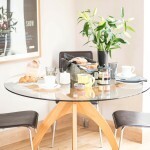 Providing accommodation in Southam, it is perfect for those travelling on business who want peace and space to relax after work, for families exploring the area who don’t want to squash into a typical hotel room, for friends attending a local event, or couples wanting luxury, privacy and independence. The self-contained suite consists of a beautiful large bedroom with luxurious en-suite bathroom, and a spacious living area encompassing a lounge area with double sofa bed, dining space and kitchenette. The apartment is just a few minutes walk from Southam town centre, and only a few hundred metres from the award winning Warwick House wedding venue. "absolutely lovely, you’ve thought of everything"
"absolutely blown away by this place. Been in many B&Bs, this is by far the best ever, don’t want to leave"
"fantastic apartment, we feel thoroughly spoilt. 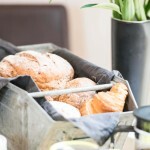 Lovely breakfast, we will stay again when visiting family"